I love The Laurie Berkner Band! I only heard of her through Nick Jr.! LOL! I’d love to bring my kids to see her! No, but it sounds like a lot of fun. …and I don’t even have kids! No I haven’t. The best concert I have seen was a couple of years ago by Earth Wind and Fire. Too many good songs to list. I haven’t heard about this band.. hope you had a blast at their concert. I know I’ve seen her on tv but never live and I don’t remember any songs but I’m sure my kids do. I’ve not even heard of her. For me, my favorite concert of all time was Aerosmith in 1993 and then again in 2007. Menopausal New Mom´s last blog post ..Aloha Friday – Has Santa Moved To China? I’ve not seen Laurie Berkner in concert. My favorite concert would have to be when I saw Elton John in 1972. When he sang Crocodile Rock Bernie Taupin danced on stage dressed as a crocodile. 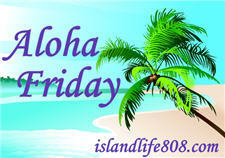 Cathi´s last blog post ..Aloha Friday – One Crazy Busy Week! I’ve been to a two concerts when I was in my country. I know they were gospel but I can’t remember them. Haven’t been to any other….as yet. That is way cool and I hope you have wonderful fun at the concert with your family! JamericanSpice´s last blog post ..Seasonal Stress + Peace – Aloha! Yikes- I’ve never heard of her. I guess I’m more like your parents. Harriet´s last blog post ..How has your weather been? We see them on television all the time but never in person. My kids love dancing to their songs! kailani´s last blog post ..Happy 6th Birthday Kiana! No, it’s been ages since I was at any concert.